Tasting awesome isn't a given for meatloaf though—I suffered so many bland and mushy meatloaves in my youth that I avoided them altogether for a large portion of my life. Even though I've found some tried and true recipes at this point, I'm still always experimenting with different additions to flavor the loaf. 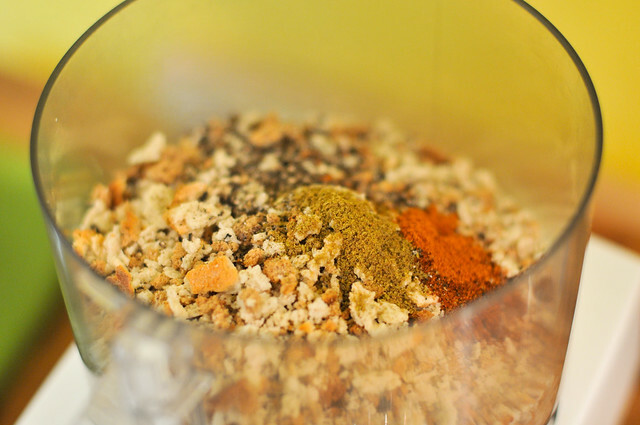 This time around, I subbed out my usual Saltine crackers—way better than breadcrumbs—for herb stuffing mix on whim when I saw it at the grocery. In the name of flavor, I also took the extra step of sauteing the veggies prior to adding them into the mix. 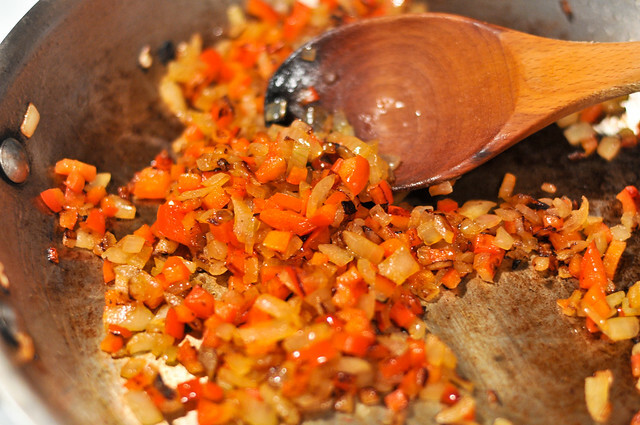 Onions, red peppers, and garlic were all given time in a hot pan to intensify and soften. 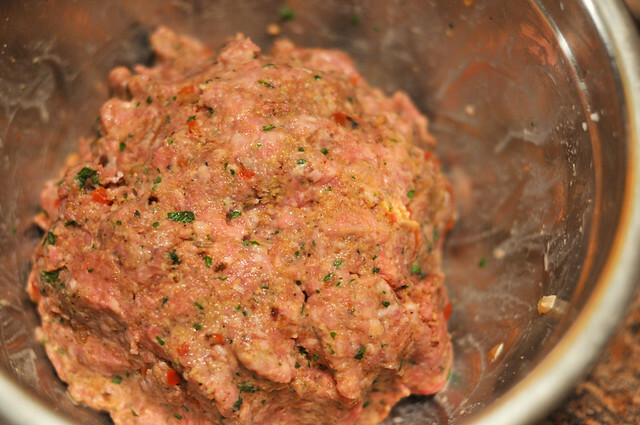 The veggies and stuffing mixture were then added into the meat trifecta that makes up meatloaf—ground beef chunk, veal, and pork. 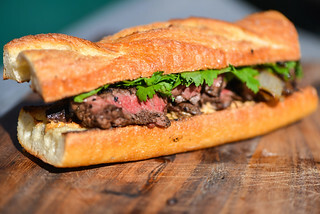 This balance of meats creates the perfect combo of flavor, juiciness, and tenderness in my opinion. 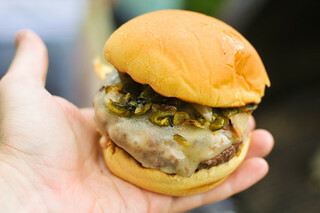 The chuck does most of the work in the beefy flavor department, while the veal builds on that flavor in more nuanced way. 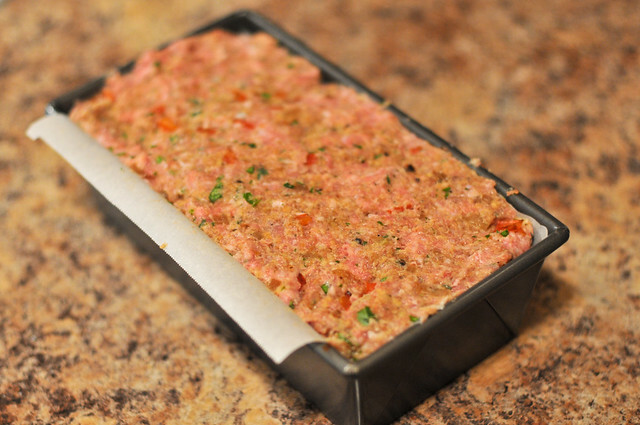 The pork is good source of extra fat, which keeps the loaf moist during and after cooking. Once meats and fillings were throughly combined, I used a pan merely to mold the loaf. This can be done freeform, of course, but I like the nice shape given the final product when using a mold. The one think you really don't want to do is to cook a meatloaf in the pan, which is a recipe for mushy meat and a missed opportunity for the addition of a tasty glaze. While I've been all about the loaf in the winter, this is actually the first one I ever brought to the grill. 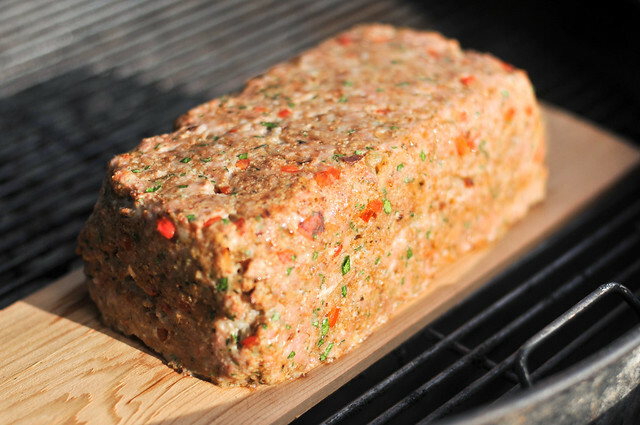 I have my current interest in planking to thank for that, because a wood plank just happens to be the perfect size for a meatloaf, and the fact that it adds a light woodsy flavor is just an added bonus. The meatloaf continued to cook until it hit 155 degrees in the center, which took around 45 minutes more. It emerged from the grill with the barbecue glaze beautifully baked in with some crisped browned spots where the loaf was exposed to more heat. Man, this is the way to start a new year! The solid brick of meat was outstanding. The intense flavor of the glazed loaf overshadowed any woodsy notes from the plank, but some smoking wood that was thrown on the coals did lend a faint smokiness. The standout though was the herb stuffing, which brought a lot to the party and stood well against the beef. The barbecue sauce glaze also did wonders to make this meatloaf way better than average, adding a sweet tanginess I wanted to get in each bite. I was so proud of actually loosing weight this year, but now I'm even prouder of this meatloaf which helping put it back on. 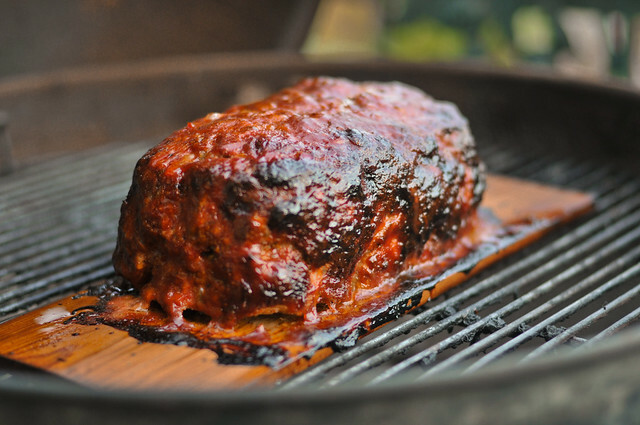 Planked, smoked, and brushed with a barbecue glaze, this meatloaf delivers on big flavor, putting it the top ranks of loaves of meat. Light one chimney full of charcoal. When all the charcoal is lit and covered with gray ash, pour out and arrange the coals on one side of the charcoal grate and place wood chunk directly on top of coals. Set cooking grate in place, cover gill and allow to preheat for 5 minutes. 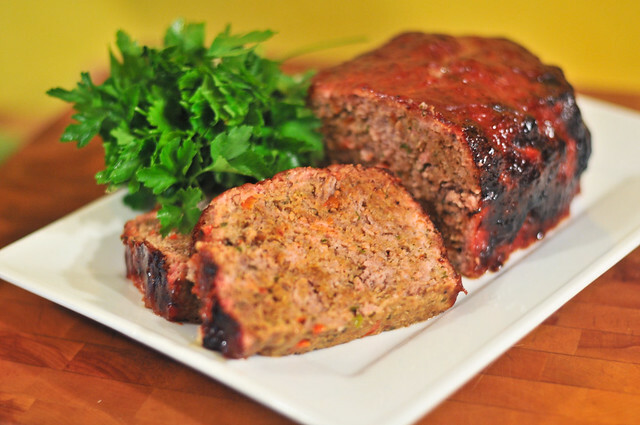 Place planked meatloaf on cool side of grill, cover and cook for 15 minutes. where do you get your planks? the one time I tried to cook something on a plank (admittedly, on my grill, not over coals) after leaving the cover down over the plank for 2 minutes all I had left were some embers. This after I had soaked the plank for a solid 1/2 hour. It looks like you cook with planks frequently. Any suggestions for selecting better quality ones? The plank idea is something I really want to try. 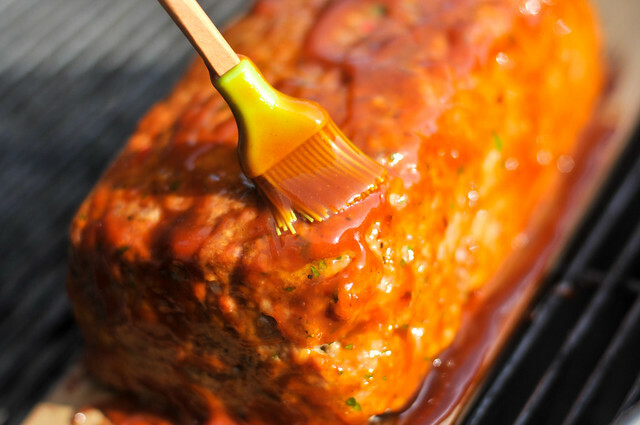 Our best meatloaves have involved a similar and simple glaze. Nice post. Thanks for sharing it! 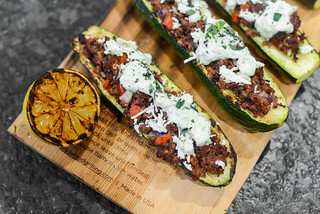 I love the pics and I'll try the recipe, and I think the reason you didn't get much flavor out of the plank is that you didn't get it going first. 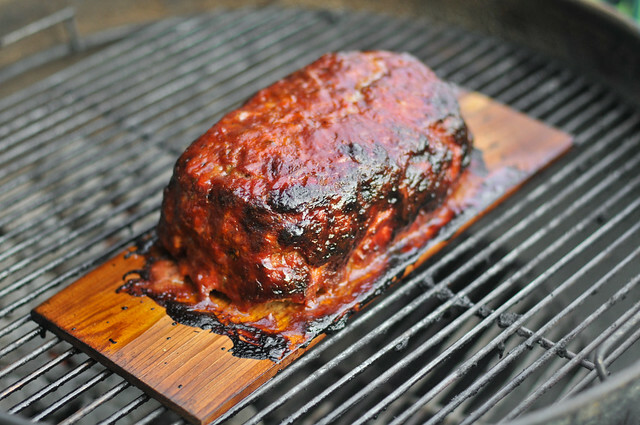 Try prepping the plank over direct heat for five minutes or so before moving it to indirect heat and cooking on it. You don't need additional wood for smoke if your plank is smoking. Just out of curiosity, when you covered the bbq and cooked indirect, how did you adjust the vents? What is the ideal cooking temp? Too hot and I can only imagine the glaze would burn to carbon in an hour. @Pete I really like the aFire planks for their looks and durability. Their oval shape isn't always ideal though, so I've been using these planks when I need more space. @Jason When the meatloaf first went on the grill, it was still pretty hot, around 425. Once the loaf was ready for glazing, the temp had dropped to the 350-375 range and stayed there the rest of the time with the vents open all the way. Superb Josh! I've done them on the grill a few times but haven't tried the plank route yet. @Rob I've been using planks how you described as well--it all depends on the recipe and what I'm trying to get out of it. Glad you tried out the recipe and liked it! You reference herb stuffing. Can i assume it was something like "stove top stuffing"